WSU President Floyd, right, shakes hands with the governor. Gov. 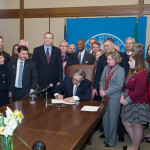 Jay Inslee signs the bill. OLYMPIA, Wash. – Washington Gov. 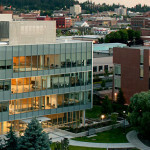 Jay Inslee today signed into law a bill that gives Washington State University the authority to create an independently accredited medical school in Spokane. House Bill 1559 amends a 98-year-old state statute that gave exclusive rights to provide medical education to the University of Washington. The bill was nearly unanimously approved March 25 by the Senate; that followed an 81-17 vote in the House earlier in the month. The governor signed the bill during a ceremony in Olympia. The ceremony can be viewed at http://tvw.org/index.php?option=com_tvwliveplayer&eventID=2015040039. “Thanks to the Affordable Care Act, more people are now covered by health care,” Inslee said. “It’s not just that more people are covered – there are also more people in our state. We have depended on doctors trained in other states to come to Washington to practice. Yet the needs of our rural and underserved communities are not being met. In some areas, shortages are great. 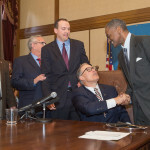 Inslee was joined by WSU President Elson S. Floyd, who has worked to convince legislators of the need for a second publicly funded medical school in Washington. Also at the signing ceremony was the bill’s prime sponsor in the House, Rep. Marcus Riccelli (D-Spokane). An identical bill was introduced in the Senate by Sen. Michael Baumgartner (R-Spokane) and a bipartisan group of 17 colleagues. “A new WSU medical school will help produce the doctors we need and will be an engine of economic growth creating thousands of jobs,” said Baumgartner. Baumgartner and Riccelli worked closely with WSU administrators as they shepherded the bills through the legislative process. Now that the medical school policy issue has been decided, attention has turned to the state budget. WSU has asked lawmakers for $2.5 million during the next two years to begin the accreditation process that could last as long as two years. Once preliminary accreditation is granted, the university can begin recruiting and accepting students. The goal is to admit the first WSU College of Medicine class to begin in August 2017.